How To Find a Meaningful Job! ” Contrary to some expectations, it isn’t only money we want from work. We also need our work to feel ‘meaningful’. 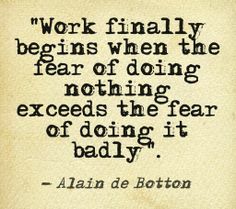 But what exactly is meaningful work, and where can we find more of it?” By the fascinating Alain de Botton – Swiss philosopher of everyday life. He is the founder of The School of Life, a dedicated organisation rethinking education and developing emotional intelligence through the help of culture. We will let this video from the School of Life do the talk. First, it should tap into the deepest, most sincere and talented parts of us. This will help you define your vocation. Career coaching and psychotherapy help. Second, a meaningful job is that which at some extent, helps others, fixing a existing problems. A job which, in one way or another, serves humanity. Look for extended work placements that fall outside of the conventional avenues for employment. Dig deep into the list of organisations offering jobs in your interested field. E.g. Valentina loves to educate. Therefore, she continues to look for opportunities which enable her to spread her knowledge and positivism into others. She is an avid gender justice advocate, fitness and nutrition lover, and an endless idealist looking to solve fundamental realities such as the refugee crisis. Therefore, most of her professional endeavors revolve around these spheres of interest. Third, when the person performing the job can sense that day-to-day, their works impacts upon an audience. Give work the intimacy it deserves. Allow yourself to connect to other in meaningful ways even if you work for giant corporations. Do you want to be proud of what you do at the end of the day? – Feel free to contact our HonuGuava speaker and coach Valentina in order to understand your authentic working identity and find a meaningful job.